To successfully manage social media for your business or blog, it’s essential to use a social media content calendar. A content calendar will allow you to consistently post engaging content every day which will help you grow your following and increase engagement with your posts. Plus, a calendar will provide a streamlined process that will save you hours of time and stress. These benefits are not just from my own experience. 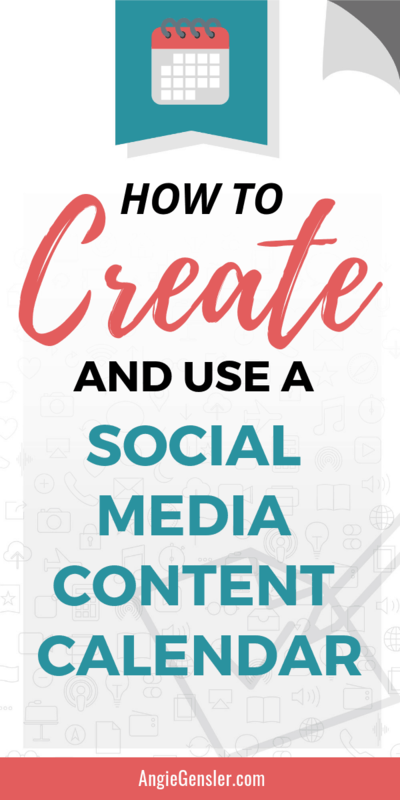 In this post, I’m going to walk you through how to create and use a social media content calendar and finally master social media for your business. Please note this post may contain affiliate links and I may earn a commission if you click them and make a purchase. This is, of course, at no cost to you. Please read my disclaimer for more information. I created my first social media content calendar five years ago when I managed the social media channels for the company I worked for. Every Friday, I would log in to HootSuite (my social media management and scheduling software) and schedule all my posts for the following week. Some weeks, I could get all my posts done in 15 minutes. Other weeks, I would struggle for hours, at a complete loss of what to post. This weekly struggle left me feeling uninspired and defeated. Then one day I had an idea. What if I create a calendar with prompts or ideas of what to post each day? I tested my idea and I’m proud to say the calendar completely transformed my social media process! The calendar got my creative juices flowing and significantly sped up my content scheduling process. 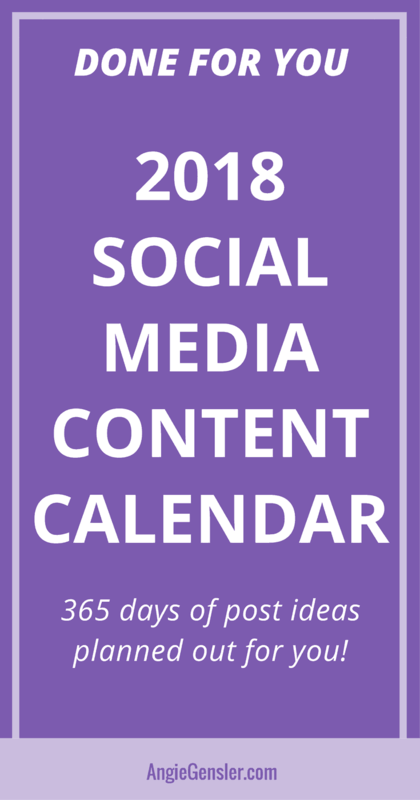 The calendar helped me consistently post unique content every single day of the year, which is why I continue to create a social media content calendar every year. When creating a social media content calendar, the first step is to identify what calendar tool you plan to use. You can use free tools such as Asana, Google Calendar, Google Sheets or an excel spreadsheet. Building out a calendar from scratch can take you hours! 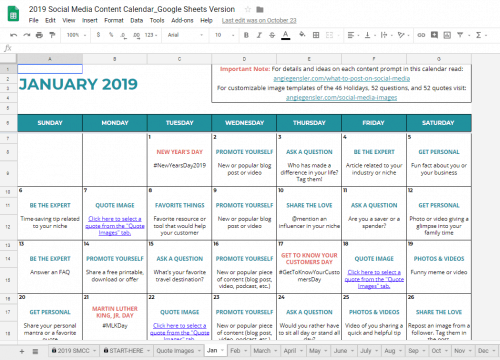 Give yourself a MASSIVE head start and grab my 2019 Social Media Content Calendar. You’ll get an entire year of post ideas planned out for you and it comes as an editable Google Sheet or Excel spreadsheet like the photo above. Once you have your calendar tool selected, it’s time to conduct research. Open up your dear friend Google and search for a list of the major national holidays in your country. Or you can skip the research and read: The Complete Calendar of Social Media Holidays for 2019. Identify the holidays you want to recognize on social media and add them to your calendar. Next, research national days/weeks/months such as National Breast Cancer Awareness Month or National Friendship Day. 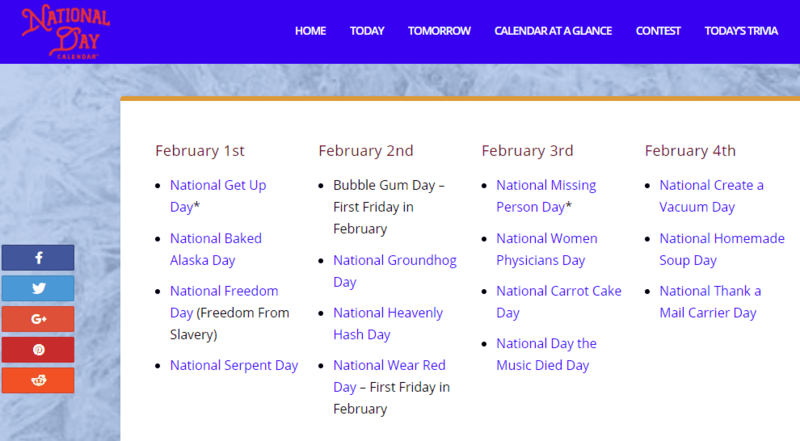 If you live in the United States, NationalDayCalendar.com is an outstanding resource to find national days related to your niche. No matter what type of business you own, there is a day you can celebrate. Once you’ve exhausted your national holiday research, turn your focus to your local community. Are there important days, festivals, or sporting events that occur in your local community that you want to recognize? A business owner in Lincoln would absolutely want to include every Husker football game on their social media content calendar. Ignoring these “state holidays” would be suicide. Next, turn your focus toward yourself and your business. What major milestones do you hope to hit in the coming year that you can celebrate on social media? For example, McDonald’s proudly promotes the number of customers served. Additionally, think about anniversaries you can celebrate such as the day you officially opened for business. 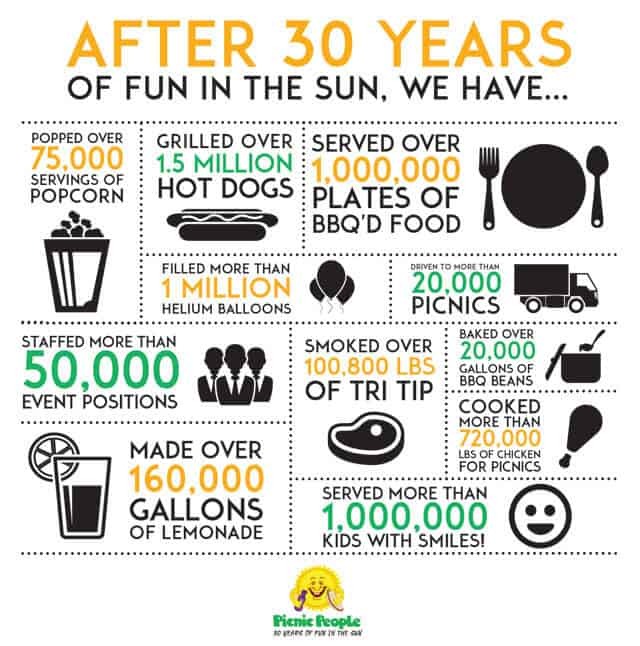 You could create a fun infographic like the one below created by Picnic People. Then, take a look at your strategic growth plan for the year. Do you have any major product or service launches planned? Do you plan to run any specials or sales throughout the year? Do you plan to attend any industry trade shows or events? 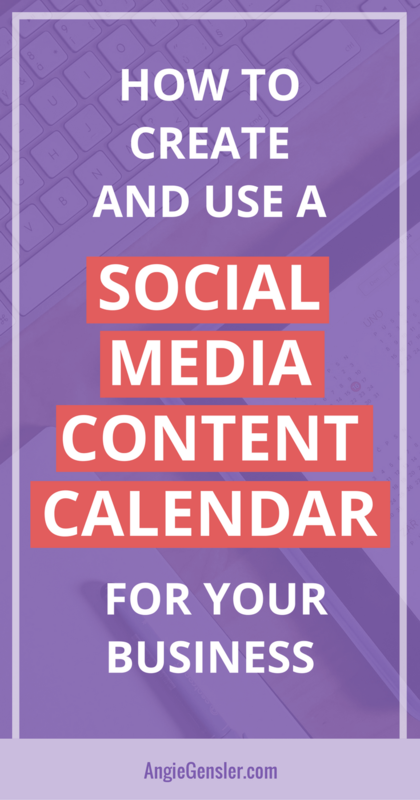 If so, be sure to add these to your social media content calendar. Once you have all the possible holidays, events, celebrations, and promotions added to your calendar, it’s time to fill in the rest of your calendar with basic day-to-day posts. For help building out your day-to-day posts, read: What to Post on Social Media. That article outlines 50 different ideas of what to post on social media. It’s is a comprehensive list of what to include in your content calendar. I also have a free cheat sheet you can download with all 50 post ideas. Another great resource to build out your content calendar is: 65 Social Media Questions to Increase Engagement. Questions are an outstanding way to increase engagement on your social media channels and allow you to connect with your audience on a deeper level. And finally, be sure to read: The Complete Calendar of Social Media Holidays for 2019 for 46 holidays to celebrate on social media. Use those three resources to fill out the remainder of your calendar. Keep in mind that you want to vary the type of posts you share. Don’t ask questions five days in a row or post inspirational quotes for weeks on end. A wide variety of the type of content you share will keep your audience engaged. You’ll also need to remain flexible to change things up throughout the year. Your strategic plan may change throughout the year, requiring you to fit in a special promotion, or you may want to share an update about a major trending news story. Your social media content calendar is intended to be a guide, not a rigid plan to be followed to the letter. Creating a social media content calendar and planning social media content ideas for an entire year can take a lot of time. Unfortunately, the process I described above could take you hours to complete. Luckily, I have a simple solution that will have you breathing a huge sigh of relief and won’t break the bank! 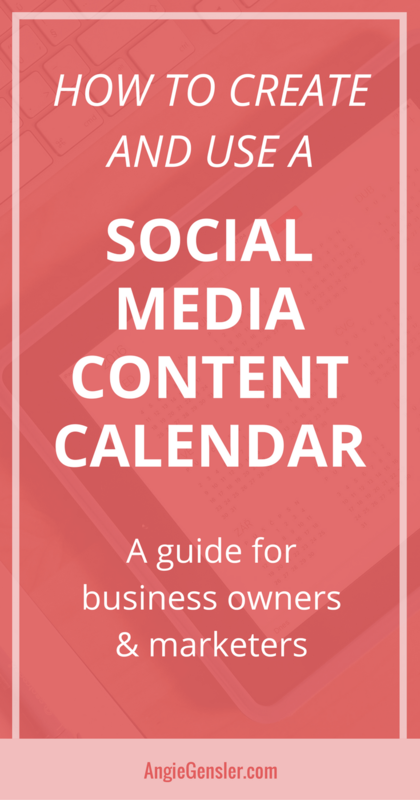 You can grab a copy of my 2019 Social Media Content Calendar. Plus, the calendar is editable so you can customize it for your unique business! I’ve done all the research and invested hours of time in creating this calendar. The post suggestions are strategically planned to ensure variety and freshness to your social media posts. Faster growth of followers after using the calendar. An increase in engagement on their social media posts. Huge time-savings and reduced stress with social media marketing. Click here to grab your copy of the calendar. 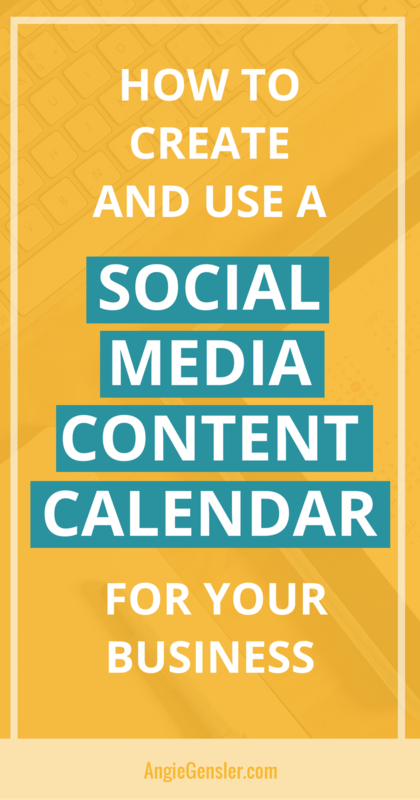 Now that you know how to create a social media content calendar, it’s time to learn how to use it to schedule your posts. A content calendar is most beneficial when you use it to schedule your posts either on a weekly or monthly basis. I prefer to schedule posts on a weekly basis because it allows me to be more flexible in switching out posts depending on what is going on that week. 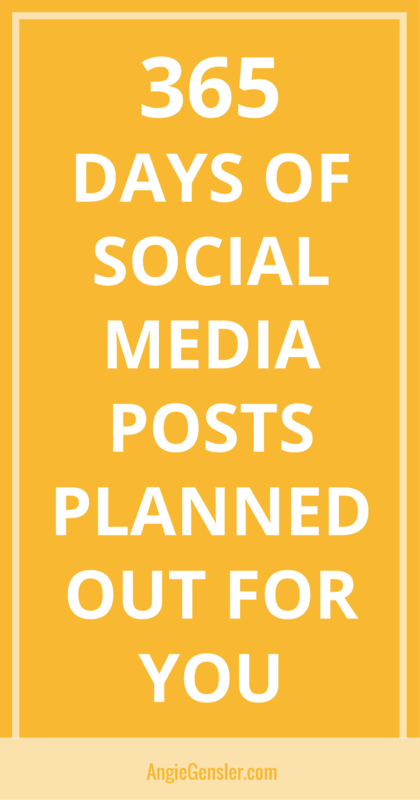 However, most people prefer to schedule posts monthly because it’s easier to block a chunk of time once a month, get into the zone, and pound out a month’s worth of posts all at once. No matter the cadence you choose, you need to sign up for a social media scheduling tool such as HootSuite, Buffer, SmarterQueue or MeetEdgar. Expect to pay $10 – $50 per month, depending on the tool you select. If you don’t already use a scheduling tool, and you don’t have a budget for one yet, read: How to Schedule Social Media Posts Without Spending a Dime. That article walks you through a detailed process on how to schedule all your social media content using completely free tools. If you have budget dollars to invest in a more robust tool, I highly recommend investing in SmarterQueue and Tailwind. Throughout my professional marketing career, I’ve used a lot of different scheduling tools. SmarterQueue is my favorite tool to schedule social media posts for Twitter, Facebook, and LinkedIn. You can get started with SmarterQueue for only $20 per month and you can customize your plan according to your unique needs. To schedule Instagram posts, I recommend Tailwind. In addition to using Tailwind for Pinterest, you can opt for an additional subscription to manage your Instagram posts. 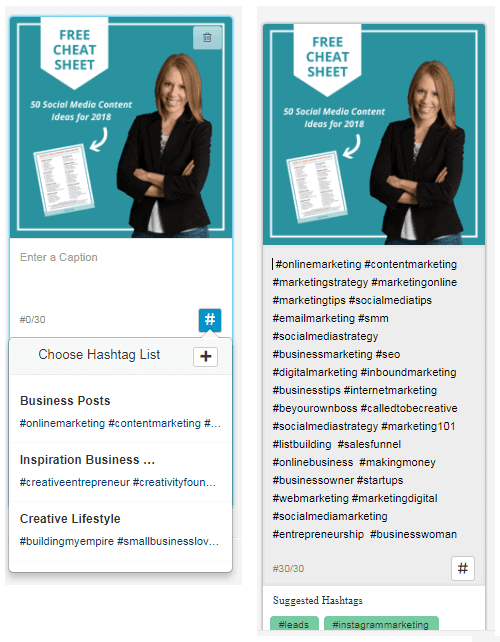 Tailwind allows you to organize your posts and ensure your grid looks great before you share your images and research top performing hashtags for your niche. You can schedule your posts in advance and Tailwind will automatically post them at the designated post time. Those features are pretty standard with any Instagram scheduling tool, but the one feature that sets Tailwind far above the rest is their smart Hashtag recommendations. You simply type in a couple different hashtags and Tailwind will automatically recommend the best performing hashtags for your niche. This feature is a game changer as hashtags are what allow you to be discovered and grow your audience on Instagram. I used to spend hours researching the best hashtags and would get an average of 10 new followers with each post. With Tailwind, I found the best performing hashtags in about five minutes, and I now get an average of 20 new followers with each post. Tailwind has allowed me to double my reach and my followers, which has skyrocketed the growth of my Instagram account. Please Note: These are my personal results, but Tailwind also publishes the Typical Results of Tailwind Members every year, so you can see exactly what the average growth rate looks like for their members. Take a look at the screenshot below of four different posts I loaded into the Tailwind scheduler. I added a few different hashtags to the caption of each post and Tailwind automatically suggested related hashtags. Notice how the hashtag recommendations are color-coded to show the best performing hashtags, the most competitive, and the most niche hashtags? Tailwind makes it really easy to select the best hashtags. To add hashtag recommendations to your caption, you simply click on the hashtag you want to include and Tailwind will populate more suggestions. Another great feature is the ability to save hashtag lists. If your posts are all related to a specific topic or niche, you can research the hashtags once, save them to a list, and use the list each time. See the screenshots below from my Tailwind account. In the first screenshot, I clicked on the “#” button to pull up my saved lists. Next, I clicked on the “business posts” list. The second screenshot shows all 30 hashtags from that list automatically added to my caption. PRO TIP: If you decide to take advantage of Tailwind’s free trial of their Instagram scheduling tool, here’s a pro tip for you. Add space between your caption and your hashtags. You can do this with periods. See the screenshot below to see an example. Once you have your social media scheduling tool(s) identified, you need to find or design images and/or videos for your posts. Whatever you do, make sure you only share images you have the rights to share. Ripping images off of Google is illegal and can get you in serious legal trouble. To learn more about the type of images you can share and how to find free images read: 6 Best Websites to Quickly Find Free Images. Another option is to use your smartphone to take your own photos and videos or design custom images and graphics. You’ll also want to design your own images and graphics for special holidays, quotes, and questions. To design your own images, you can use a free online design tool such as Canva.com. Canva.com has a lot of great templates you can use to quickly and easily create professional quality images. If designing your own graphics feels like one more thing you can’t possibly add to your already busy plate, there are other options available. You can either hire a professional designer or a virtual assistant or you can purchase done-for-you image templates. Pre-designed templates are an affordable solution if hiring a designer or VA is not in your budget right now. If templates sound like a good option for you, then check out these 150 Social Media Image Templates. Once you have all your tools identified and your images and videos created, block off time to schedule your posts. To give you a crystal clear example of how to use a social media content calendar, I’ll outline the process I follow. Once I have all the necessary resources handy, I get to work. I begin with the next day on my calendar that needs scheduling and work my way through each day I plan to schedule in the block of time I have available. Here’s a one-week screenshot of my 2019 Social Media Content Calendar. In this instance, I would begin with the 3rd which prompts me to share a quote image. The text in the calendar hyperlinks to a list of 52 quotes I can use, which are all included in the 150 Social Media Image Templates. Once I select the quote I want to post, I will customize the image template with my logo. Next, I load the image into my scheduling tool, add a caption about the quote, and schedule it for the 3rd. Then I move on to the 4th, which prompts me to post a solution to a common problem my customers have. For this post, I could design another image in Canva, take a selfie photo, or find an image on Pexels that represents the problem. I would then add it to my scheduling tool, add a caption detailing the problem and my solution, and schedule it for the 4th. I will continue that process until I’ve scheduled all my social media posts for the week. Luckily, this particular week would be a breeze for me since the social media image templates cover 4 of the 7 days! There are numerous benefits to scheduling your social media posts in reserved blocks of time. One of the most notable is that your creativity expands and your posts become easier and faster to create as you move along. 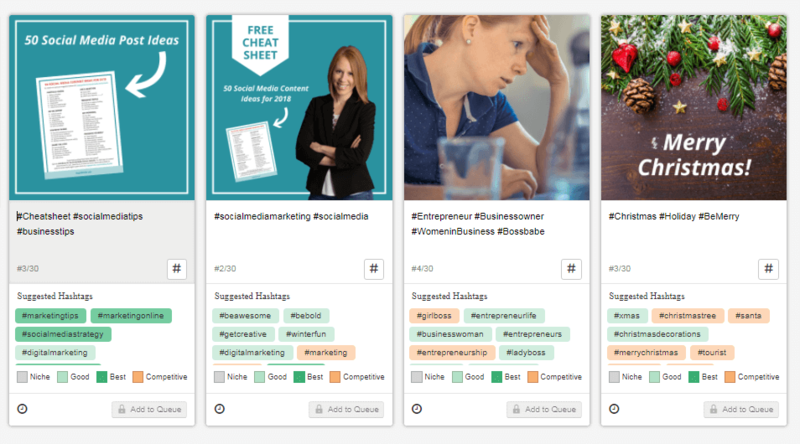 When you have a content calendar complete with prompts at your fingertips it transforms the process of posting on social media from frustrating to fun! In case you’re overwhelmed by all the information you just consumed (or you skipped straight to the bottom) I want to give you some simple action steps to get you started. Block off one full day this week to research and build out your calendar. 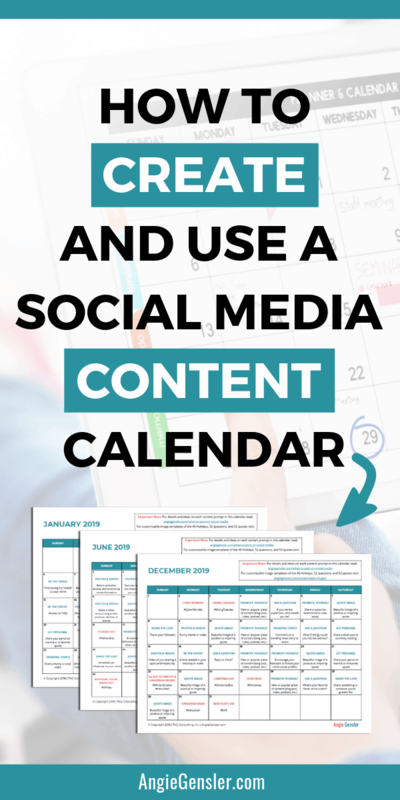 Or save yourself all that time and get a copy of my Social Media Content Calendar. Identify the social media scheduling software and graphic design tool you plan to use to create images and schedule posts. I recommend SmarterQueue and Tailwind. To learn how to get started with free social media scheduling tools read: How to Schedule Social Media Posts Like a Boss Without Spending a Dime. Create your post images using Canva.com or grab these 150 Social Media Image Templates. Schedule your first week of posts and breath a sigh of relief. 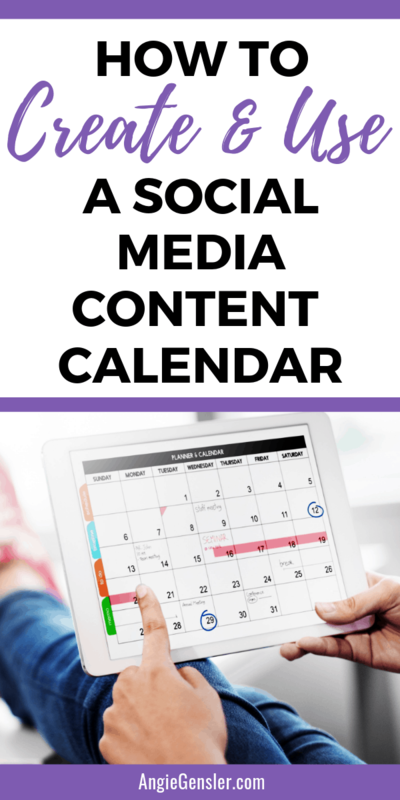 You’re going to love how a social media content calendar keeps you organized, allows you to stay on top of important events and holidays, expands your creativity, and saves you time and stress each week. 65 Social Media Questions to Increase Engagement.